The colourful Zulu costume has been part of Bonfire tradition since possibly as far back as the late 1850’s. All societies simply allowed their members to dress up as they pleased, each member trying to better the others and each society doing the same. From around the 1960’s 1st & 2nd pioneers developed. The famous Borough Zulu 1st pioneers date back to then. Original costumes varied, from the quality of the magnificent beadwork & ostrich feathers that adorn outfits today, to the grass skirts & wigs of the past which would have been more at home on a Hawaiian dancer. Times and social acceptance changed and by the 1980’s the Borough Zulu costumes had taken on a new splendour. Some of these might have been more akin to the flamboyant costumes worn by traditional young Zulu men who were known as “The Durban Rickshaw boys”. The boys mounted the horns of bulls on their huge headdresses to signify strength as they needed such to pull their rickshaws on a daily basis which was extremely hard work. They used to do it for only 3 or 4 months, but that earned them better than a year’s normal income back in Natal. Our Zulus were led during the 1970’s & 80’s by Ted Over BEM, whose head dress topped 14 foot high.in those days, up to 100 Zulus were in the Borough procession. Many came from Brighton & worked at Allen West. Fast forward to the 21st century and our 1st pioneer Zulus have been led in more recent years by Amanda Taylor. Our Zulus, nowadays numbering 30-40 and resplendent in costumes that can take anything up to 3 or 4 years to complete, lead our evenings’ events. They make a most colourful sight. Last year our Zulus, at Amanda’s request, were led by “Zulu Tradition”, a company of genuine Zulu singers and dancers, who were greatly cheered and applauded by the crowds throughout the town. 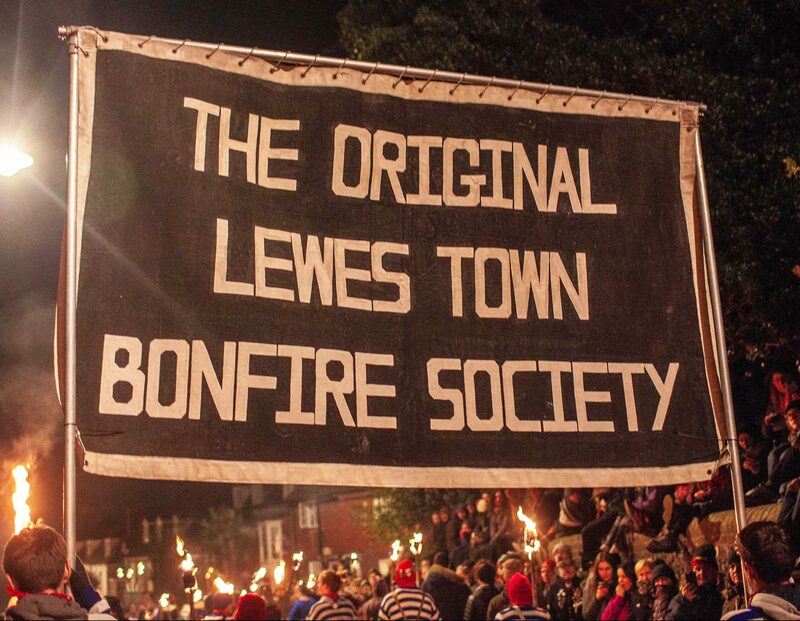 It was an experience which was unique to the Borough & possibly bonfire as a whole.